This is a nice old postcard view! It is circa the 1940's or so. It pictures a view of the old Orthopedic Hospital at Gastonia. The patients and nurses have come outside for the Watermelon Festival. Watermelons line the ground. Nurses in white uniforms line up at left. A nice piece of N.C. postcard memorabilia! Back of card is divided and is postally unused. Back has printed hospital details. Condition is excellent! Any other lines or waves are from the scanner and not on the actual image. Your item is shipped to you safely in a rigid mailer. #244 Linen Charlotte NC Hotel & Restaurant ! Here's a super NC linen image! 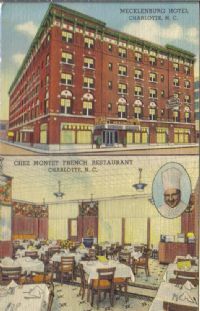 It pictures a tri view exterior/interior of the old Mecklenburg Hotel and Chez Montet French Restaurant at Charlotte. Back describes the establishment and is divided. Card is postally unused and mint! A super advertising linen!